Excessive sweating beyond that required for physiologic needs is referred to as hyperhidrosis. It is thought to be due to overactivity of the sympathetic nervous system (part of what is called the autonomic nervous system, responsible for body functions that we are not normally aware of). Typical stimuli include heat, anxiety and taste however, it frequently also occur without any identified triggers. This sweating is localised to specific parts of the body, particularly the hands, armpits and feet. This condition has only been recognised as a medical problem for a relatively short period of time. Of some interest however, references to people in history can be found with classical descriptions of hyperhidrosis. For many people in the past, they have been too embarrassed to talk about this condition and so the true incidence is really unknown and probably very under reported. Many doctors are in fact still unaware of the existence or potential availability of treatment for the problem. Although no physiologic harm comes from this excessive sweating, it can be very debilitating from a social, occupational and emotional point of view. Successful treatment of this disabling condition is one of the most satisfying procedures in our practice as it can change significantly the quality of life for the generally young population who present with the problem. These medical therapies have varied success rates. Medication is very successful but has significant side effects and many contra-indications and should be carefully considered if at all. Whilst local injections are also successful, the effect is only temporary. 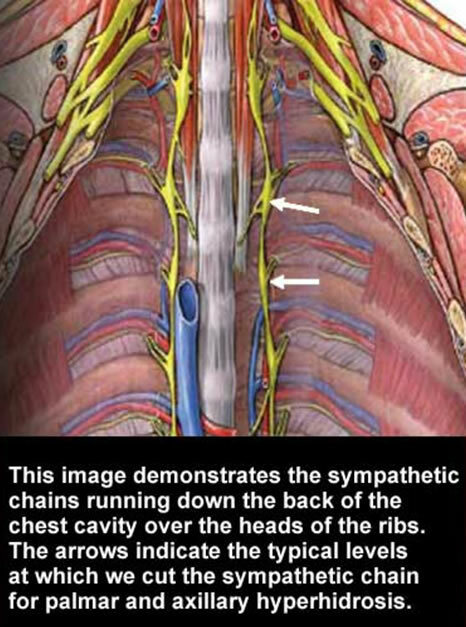 Our practice offers the surgical option of Thoracoscopic Sympathectomy for this potentially disabling condition. This is a minimally invasive procedure that aims to ablate the sympathetic outflow to the hand and/or axillae (armpits) thereby alleviating further sweating in these areas. There are many variations for this surgery and many “myths” about the treatment. Please do not hesitate to speak to us if you have already searched the internet and become confused about the options for treatment. Compensatory hyperhidrosis; meaning excessive sweating that occurs in another area. This may occur in up to 25% of patients and it is unpredictable where and who will have this following surgery. Most people however find this more manageable than the sweating in the affected area that has been treated and many will gradually improve over a six to twelve month period. Horner's syndrome. This is where the sympathetic nerve supply to the face is affected, typically causing loss of sweating to the face but more importantly affecting adjustment of the pupil in the eye, potentially therefore affecting vision. This was mainly seen after open surgical cervical sympathectomy and is very uncommon with a minimally invasive thoracoscopic procedure. Haemo/pneumothorax. As the procedure involves inserting a telescope into the chest cavity, complications can include bleeding into the chest (haemothorax) or air being trapped in the chest cavity with collapse of a lung (pneumothorax). Whilst these complications sound frightening and can be serious, they are very uncommon and are generally easy to treat. These can be more fully explained at the time of consultation with one of our specialists. Complications related to having a general anaesthetic. Recurrence of the excessive sweating in the same area. This is generally considered to be uncommon. One of our surgeons will be happy to discuss these complications and all aspects of hyperhidrosis with you in greater depth during consultation.